'Lilac Champagne' (Melba Hamblen, R. 1964). Seedling# H59-66. TB, 38" (97 cm). Late midseason bloom. 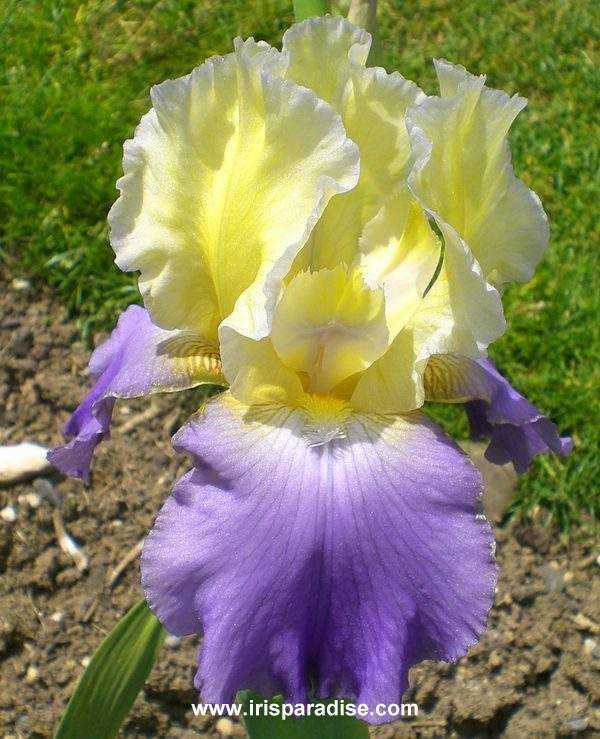 Color Class Y4BV, Standards barium yellow; falls lobelia blue-violet, light yellow beard. 'Mollie Emms' X 'Whole Cloth'. Mission Bell 1965. From AIS Bulletin #177, April 1965. Introducing LILAC CHAMPAGNE (Hamblen) M-L 38" Smoothly colored yellow and blue-violet bicolor. Standards are Barium yellow outlined with a fine etching of the fall color which is a tone between Wisteria violet and French blue. Wide petaled, beautifully formed blossoms are exceptionally well spaced on tall flexuous stems. Mollie Emms X Whole Cloth. Sdlg. H59-66. HC 1963. Net $25.00. Mission Bell. JPG lilacchampagne01.JPG manage 52 K 02 Dec 2014 - 03:14 Main.TLaurin Photo by Don McQueen,London, Ont. Canada Zone5. JPG lilacchampagne99.JPG manage 56 K 29 May 2014 - 19:44 Main.TLaurin Photo by Don McQueen,London, Ont. Canada Zone5.